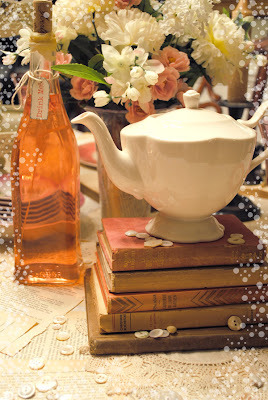 Artful Affirmations: Mad Tea Party! Well, the Hatter has done it again! He sent out invitations to Alice, the White Rabbit and myself, hoping to lure us to his home for tea and a book club. The Hatter is mad of course, but loves books....all types, and as we soon found out...in all ways! The day began sunny as I headed outside to travel to his home. 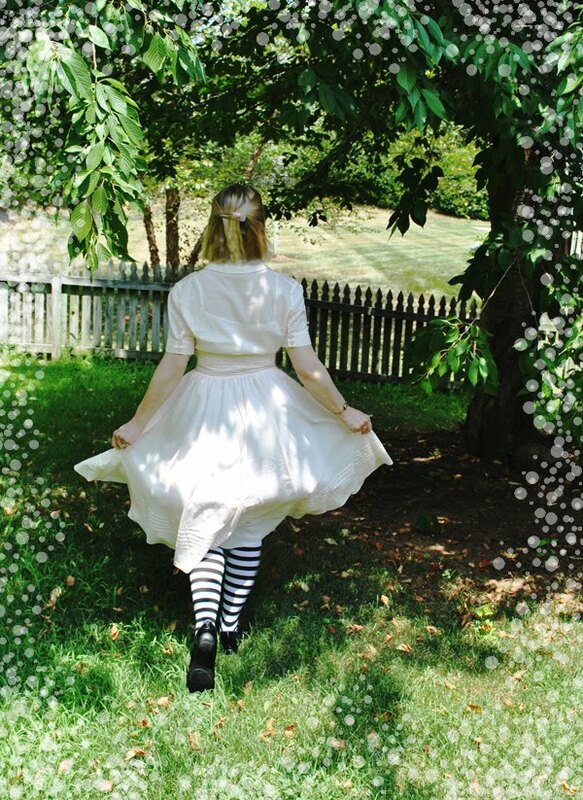 Alice too, receiving her invitation also left her home and wandered the forest looking for the doorway that would lead her to the Hatter's world. She stopped for a moment or two to catch up on her reading as she was behind the group....the Mad Hatter was always a fast reader, as was Rabbit who, surprisingly enough, never dallied over reading but got right to business. So here is Alice still reading while I was making my way to Wonderland. The Hatter, being anxious to greet his guest, met me halfway and then left me to continue as he sought for Alice and Rabbit. He found Alice reading, and to minimize her embarrassment at being caught catching up, told her his hat was drooping...so she fixed it. And no more was said about her reading at the last minute! It was at this time that a storm blew in, huge black clouds heavy with rain above them as they made haste to the Hatter's home. Luckily, I saw the storm coming from far off and I brought in everything the Hatter had set on his outside table and meticulously laid it all back in his dining room, knowing that details were very important to him. The cupcakes spoke to me! "Eat Me!" they said! But no, I knew better than to start without the others and I am pleased to say I was not persuaded! Just as I had filled the last tea pot with hot water and tea bags and sat down to rest my weary whimsical legs, Alice and the Hatter blew in the door with a strong gust of wind. "I do hope you are not angry with me," I said as I showed them to the table. You never know with the Mad Hatter, he may have planned to have the tea party in the middle of a raging storm! But the Hatter smiled and showed us into the room. "Not at all, dear friend, I am in your debt for sorting out a dry place for us to have tea and to read our book... no need, none I say... no need to get books wet!" Sitting comfortably in our chairs at the table, we talked of Wonderland's latest news and waited for our tea to steep. 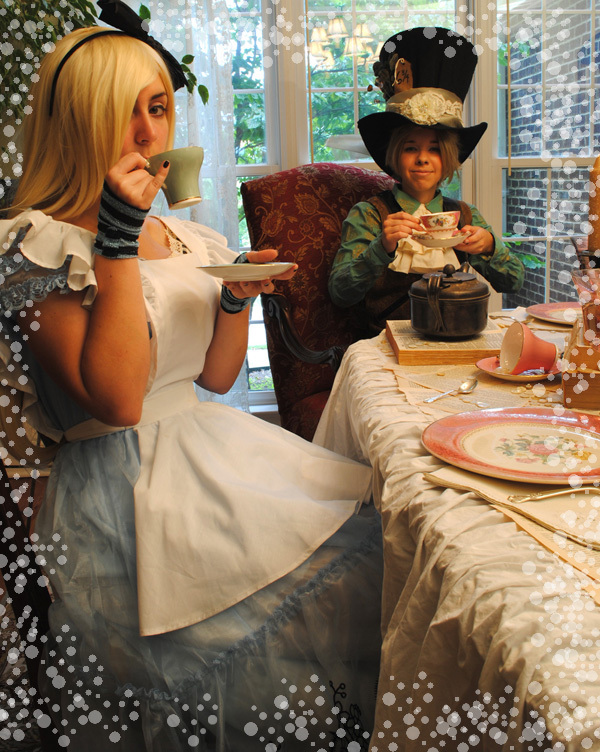 Before I knew what was happening, the Mad Hatter picked up an old silver tea pot and poured Alice a cup of...tea!? "Buttons?" asked Alice as she peered into her pretty cup. Her puzzled face looked up. 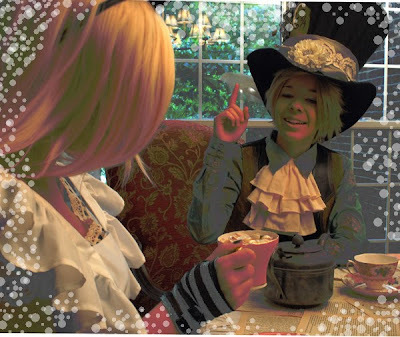 The Hatter looked into her cup. "Yes, and my best buttons at that!" "B-but," stammered Alice, "I can't drink buttons!" Still curious as to the Hatter's meaning. "Why, my dear girl... I make it my business to drink a cup of buttons every day!" he stated cheerfully. At this point I stepped in and asked how his reading was coming along, surreptitiously taking the tea bags from the tea pots and pouring myself a cup. "Marvelous!" says he. "In fact I found a new book that I truly love and I want to share it with both of you." Moments passed and he did not elaborate. "Oh, well, would you tell us about it?" I asked. The Mad Hatter smiled wide and said, "Read it yourself!" Alice and I looked puzzled at each other. "Where is it, dear Hatter?" 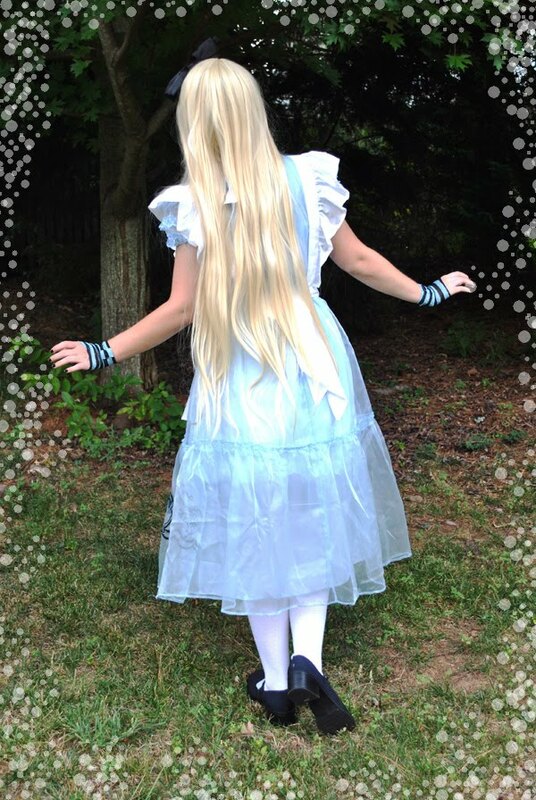 Alice asked in her sweetest voice. The Hatter only chuckled and waved at the table. "Why, it is right here under your noses!" We looked and looked at all the old books he had stacked on the table... Then he picked up a random sheet (I had painstakingly laid out all the loose pages when I recreated the table in his dining-room, quite surprised at it all). "Here, I have laid all the pages out so you can enjoy this story too." He smiled again. Alice and I looked at the hundreds of loose pages that covered the tablecloth. "How do we know where to start and how to proceed?" Alice asked bravely. The Hatter readjusted his hat and said, "Why, the book is so good, you can start anywhere and proceed how you like!" 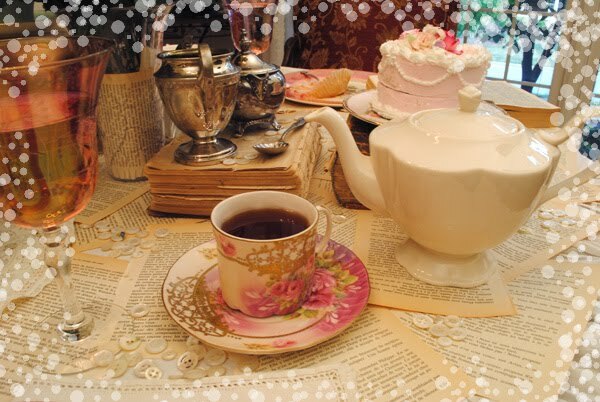 Alice poured the Hatter and herself a proper cup of tea and we all gave in to the cries of the cakes. Mmmm....delicious! 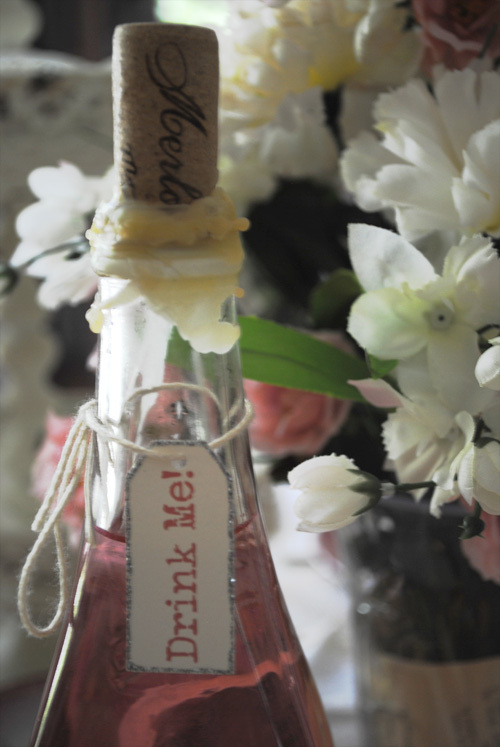 There were bottles on the table that said, "Drink Me!" but we already knew from Alice's experience that we would not be drinking tonight! Both of us had the same desire to return safely to our homes before nightfall. Eventually we got around to talking about our book... the Hatter loves to discuss the characters, Alice enjoys the story setting, and I am always interested in the subplots. All in all, we had a wonderful time in Wonderland even though Rabbit did not arrive before I left (he must be really, really late!). Thank you for visiting during Mad Hatter Tea Party hosted by A Fanciful Twist. Click on the link and you can see all the other parties! If you go to the end of my Happy June Giveaway post, you will see all 4 prizes I am offering as a thank you to all my readers! You can enter to will one or all of the gifts! Only need to be a follower for a chance to win a Tea Cup, a huge Goodie Bag, a Tea wall hanging or a lovely Altered Matchbox filled with fun! Good luck! What a beautiful post. I really enjoyed reading/seeing it. I found something that your post reminded me of. It is in ETSY, candy buttons! This woman has pulled molds from wonderful antique buttons. You have to see these. They are expensive but what a wonderful thing to have on the table for a tea! you did such a wonderful job ..i was completley absorbed in the story, lovely photos! What a lovely ,nice and funny post! It's quite difficult to look at those scrumptious cupcakes that say eat me, and not really be able to eat them. sigh. Well, thank you for letting me tag along for this wonderful party! 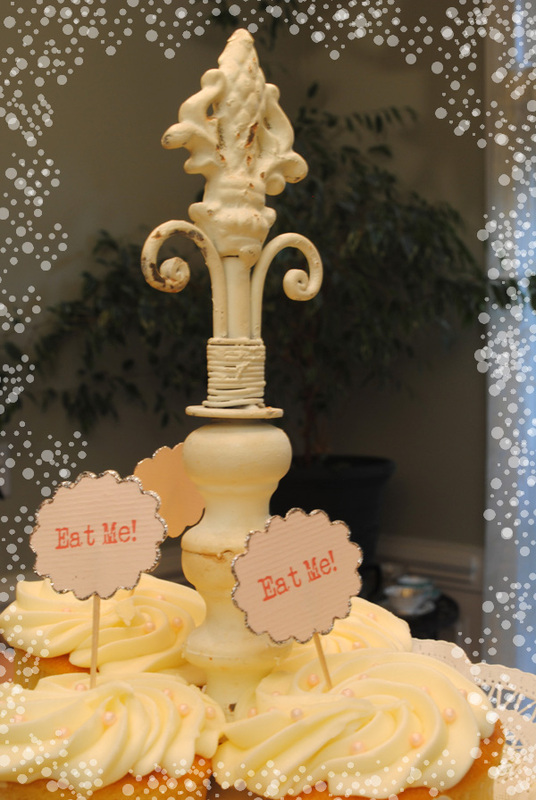 Your, I mean, The Hatter's table was set so wonderfully! Oh what a gorgeus party, you made a most wonderful story, and the table was beautiful, as were the hatter and Alice, what a fantastic scenery, dear. Your party was a hugh success..The Hatter adorable and the table stunning. The yarn you spun was delightful. This was a fantasmigorical tea party! Your story and characters were whimsically drawn - and oh! 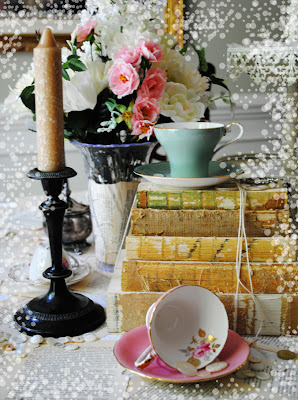 Vintage books at the center of it all - I'd have never thought to incorporate them into a tablescape - but what a perfect touch for this old book collector! Yummy treats and too many delights to recount! I love the dreamy little way you were able to frame the photos, too. Is that Photoshop? Thank you, Terri, this is a great way to start my day! Joy! Oh! So much fun! So much beauty and the most perfect costumes, ever!!!! You never cease to amaze, friend! Thanks so much! Blessings. Yay Terri...Stunning and Superb photos..what a beautiful advnture you have shared...gorgeous scene aftre scene..beautiful characters...what a sparkling affair...Shine on..a Magnificent post...YAY!! Thanks for inviting me to your party...everything was so beautiful. I fell in love with your tea cups and saucers! I have got to start a collection of my own, they are just lovely. What a Wonderland oops Wonderful tale! I enjoyed every single bit of it!! I hope you have a magical weekend! 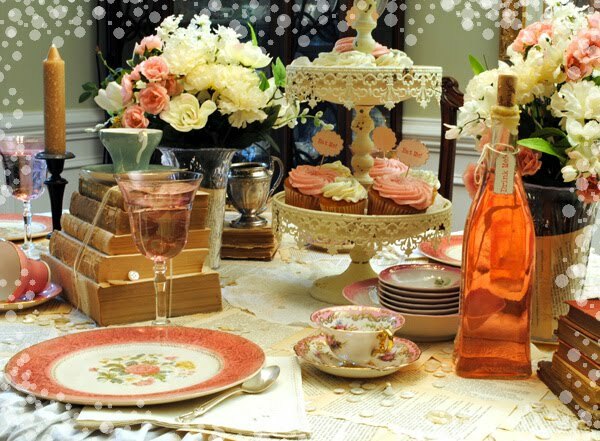 What an amazingly beautiful tea party you all had; I was drooling over your pictures! Thank you for having me, and I hope you have a wonderfully mad day! 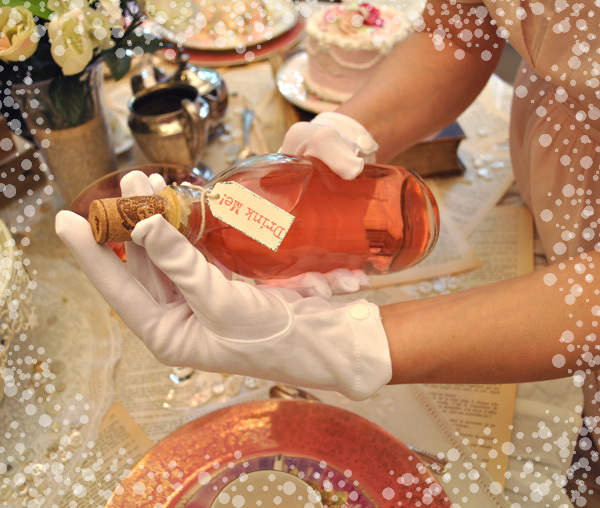 thank you for a magical, beautiful tea party! i am in love with the Mad Hatters hat!!! You have a wonderful tea party. 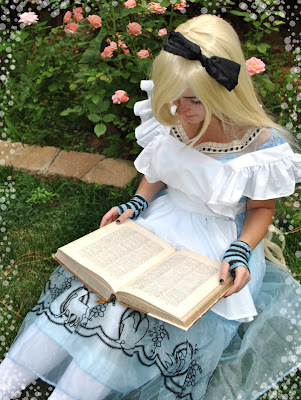 The story, the photos the costume all are magical. The cupcakes are my favorite. Fantastic work! I love your decor and your madness! amo amo amoo Tema Alice! Happy Mad Tea Party ;o) Oh, I had a wonderful time! So beautiful! And, everything was so yummy! Thank-you! And, I loved the books ;o) Have a magical day! You're the seventeenth on the list. Are all so tempting to me. Oh my! What an absolutely delightful photo vignette. Total eye candy! Thanks for sharing and all the time it obviously took to create something so lovely. I love this! 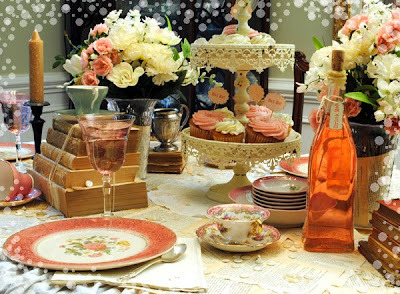 I hope you would vite my tea party, and thank you so much for the invite. I love all your photos! Your tea party is beautiful. Your Mad Hatter is the cutest. What a magical tea party! I thoroughly enjoyed it!!! Gorgeous costuming and spectacular table setting. I am your newest follower! What a BEAUTIFUL and fun party! I truely enjoyed myself! Such cute costumes! And love the buttons in the tea cup. Thanks for having me to your party! Love your photos and the treats were divine! You did such a magnificent job! You really went all out for this affair. I look forward to seeing many more posts of yours in the future! I hope you join my party! What a fun party thank you! I loved the cup of buttons especially! What a beautiful party with lots of gorgeous outfits!! What a wonderful and magical post! All I can say is WOW! Your photos and how every thing looks is outstanding. 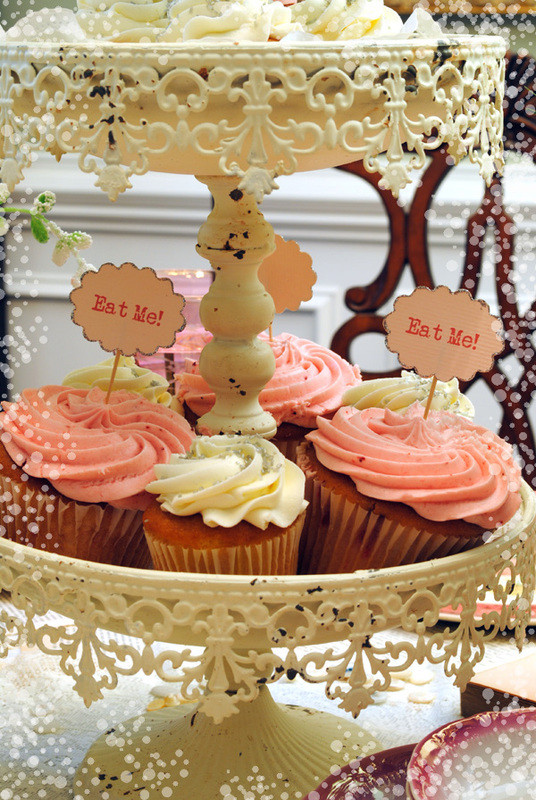 Love the cupcake holder. You have a beautiful eye for detail. I will definitely be back to visit. 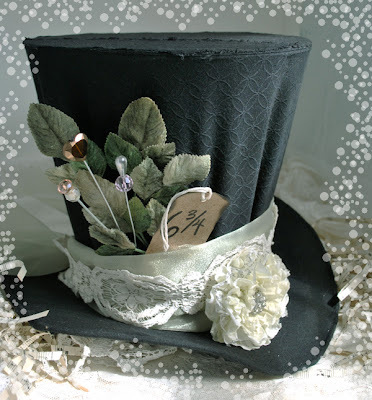 Hello Terry, ohhh wow i love your Mad Tea Party...and i love the Mad Hatter Hat...where do you buy this ??? Oh my dear Terri...Thank you so very much for allowing me to come along to your amazing tea party with Alice and the Mad Hatter. It was enchanting. In fact I am still reading those wonderful pages covering the table. This is so much fun I say. Such a sweet tea party post with gorgeous images, thanks for having me over. 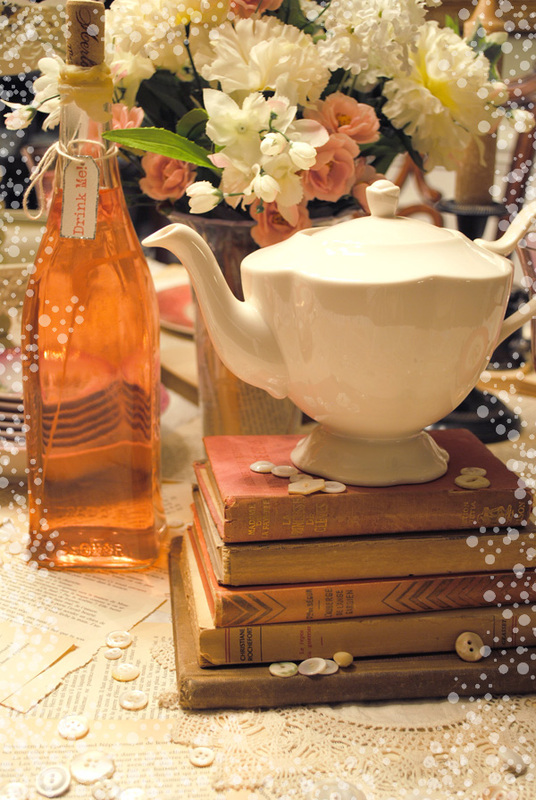 Your tea party was an utter enchantment. I had such a wonderful time! The costumes and props are just amazing. This was wonderful, Terri! I loved being a part of your tea party. The table looks wonderful; I love the books on the table. Great outfits, too, and I just love the Hatter's Hat! Such a pretty and clever party you have had!! Thank you! I'm so glad you had tea on hand to have instead of the buttons! Delightful post! Your party guests are darling! Thanks for sharing all the treats. This tea party was absolutely fabulous!!!! BRAVO!!!! Loved every minute of this. 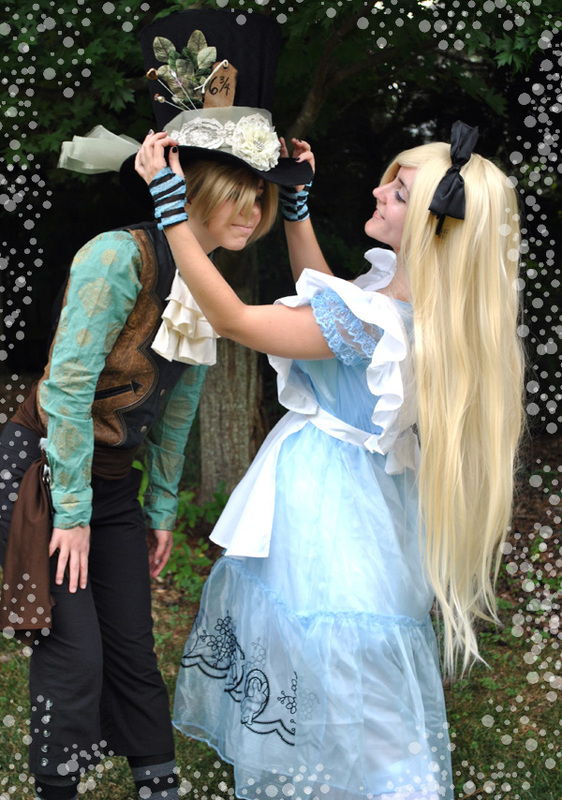 What a lovely Alice and spritely Mad Hatter! Thank you for an awesome trip to Wonderland! what a wonderful, whimsical Tea Party - thank you for taking me along on your journey. I love the cups of buttons! What a great twist! Beautiful photos and a really fun party :) I've enjoyed your post very much. I love the look of the cupcakes! 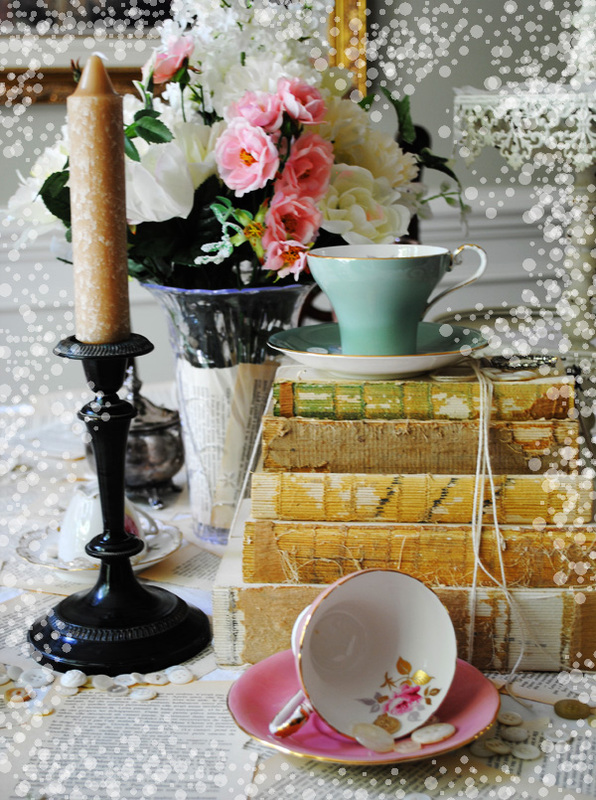 Books, buttons, tea & the Mad Hatter, what a perfect day! Thank you for stopping by my party & leaving an invite to yours! What a beautiful tea party. 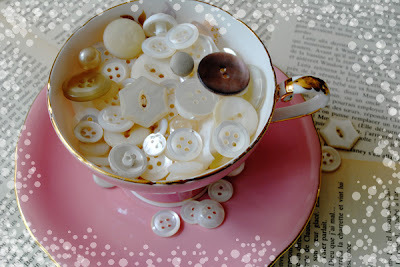 I would gladly take a tea cup of buttons myself, lol. Wow, that was just beautiful and magical! O Terri! What a delightful tale you've spun!!! I truly enjoyed it...true to Hatter form. I liked the teacup of buttons, and I so enjoyed it when he said that the book was so good you could start it from anywhere and proceed as you like. !SMILE! Thank you for sharing. Wow! So much magical muchness and so much spendidness all in one party! Your clothing is fabulous, the tea was delicious and I even enjoyed my daily cup of buttons! Thank you so much for inviting me to join in your mad soiree and for stopping by for a frolic with me! Thanks for sharing your lovely party! A fabulous tea party, a wonderful tale and such delightful costumes! Thank you for having me! I really liked the cup of buttons! Great idea. Fabulous costumes, too. 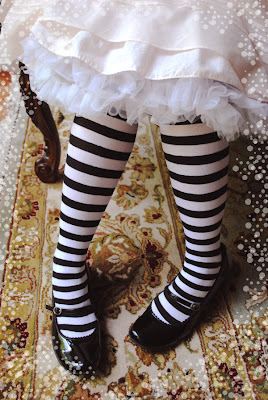 Oh, that was just a heartful of wonderland goodness, hahaheheeee! I LOVE it! Your photos, your characters, your spread, marvelous! You have outdone yourself!! Thank you for sharing your magical wonderland! 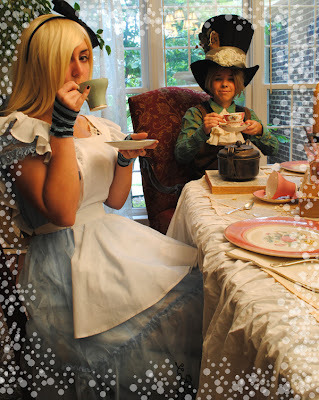 Dear Terri, What a magical mad hatter tea! 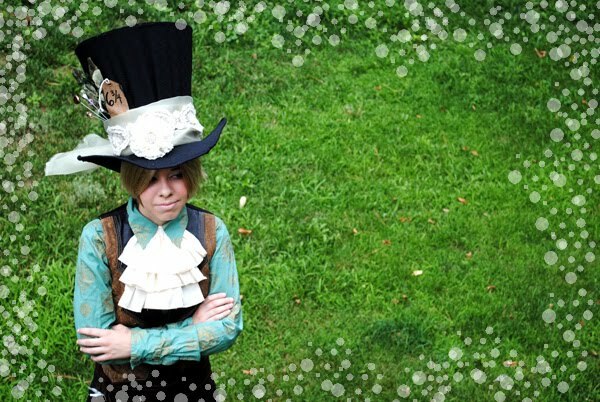 I love how your mad hatter hat turned out!! How fun! Fun, fun, fun! I love the party. You are so whimsical! What a beautiful post! I enJOYed it thoroughly! Oh what a wonderfully creative and beautiful party! I loved your story. Two of my many favorite things, tea and books, you only needed cats to make it perfect. However based on my Mad Catter party your table and books would have been destroyed and the beauty ruined so maybe it was a good think they were not there. I adore all your lovely art pieces and have signed up as a follower with my fingers crossed to win any of your goodies. This is so sweet and fanciful! You put a lot of heartfelt work into this post & it shows. I am happy to say I'm your newest follower! INCREDIBLE! One of the most engrossing posts ever. I love the photos, the story, everything! I'm so glad you stopped by my blog. Otherwise, I may never have seen this. Thanks for following me. I'm following you as well. This was so very special! I was entranced! Just love how fun it was and so well done! *new follower alert* I am so happy to make your acquaintance! I had decided to be a follower before I even started reading your tea party due to seeing all the tutorials on your blog! Hi Terri, you certainly had your hands full with the Hater and his reading. What a delightful party you had. I really did enjoy myself. Anytime books are involved I feel right at home. Thanks for stopping by my Southern Tea and leaving such a sweet comment. I'm speechless. This is truly the most imaginative post I've ever read. Your attention to detail is beyond divine, the story so fun, and the characters perfectly cast. You always amaze me, Terri. But this time I'm truly blown away. Now, where did that rabbit go? What an absolutely beautiful party! Very elegant and lovely--I'm sorry to be late (some trouble fitting through keyholes) but so glad I got to visit! Wow - what a tea party! Love the costumes and loose pages all over the table! A cup of buttons sounds wonderful, but not to drink! If you haven't already, please do stop by my tea party, too! I have a giveaway. Oh my goodness, you have put such a lot of effort into this. 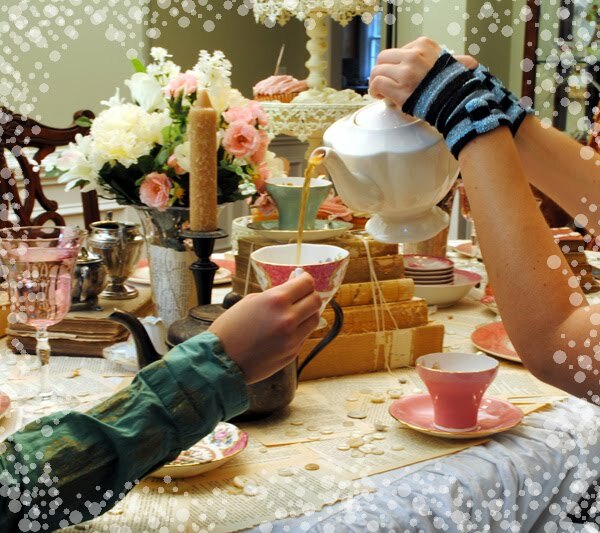 It's the most beautiful tea party and I love the costumes too. Fabulous!